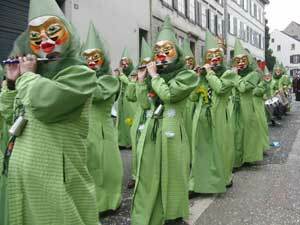 The Carnival of Basel (Basler Fasnacht, the biggest carnival in Switzerland) takes place on February 23rd, 2015. It has been listed as one of the top fifty local festivities in Europe. It starts on the Monday after Ash Wednesday at precisely 4:00 am with the so-called Morgestraich (view video). As the clock strikes four in the morning, groups of fifers and drumers in charivari costumes and masks with small headlights start moving through the dark center of down while playing their carnival tunes. Airport Taxi Service brings you there on time – please call us for our service helping you during the Carnival of Basle.